Now that Paprika 3 has been released on iOS, Paprika 2 no longer shows up in the search results in the App Store. 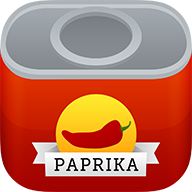 However, you can still reinstall Paprika 2 by looking in the Purchased section of the App Store. Note: please make sure you are logged into the App Store with the Apple ID used to originally purchase the app, otherwise it won't be able to recognize your original purchase.